Somehow I managed to snag this Phillip Lim for Target bag a day and a half after his collection hit the stores. It was released when we were in Chicago and I completely forgot about it, but by total luck a Target about 15 minutes away from our house had two of the black medium satchel's still available (and this leopard print scarf that I attached to it!). I couldn't believe it. I love this bag and know I will get so much use out of it. I figured I'd share what you can find me carrying in it now on a daily basis. 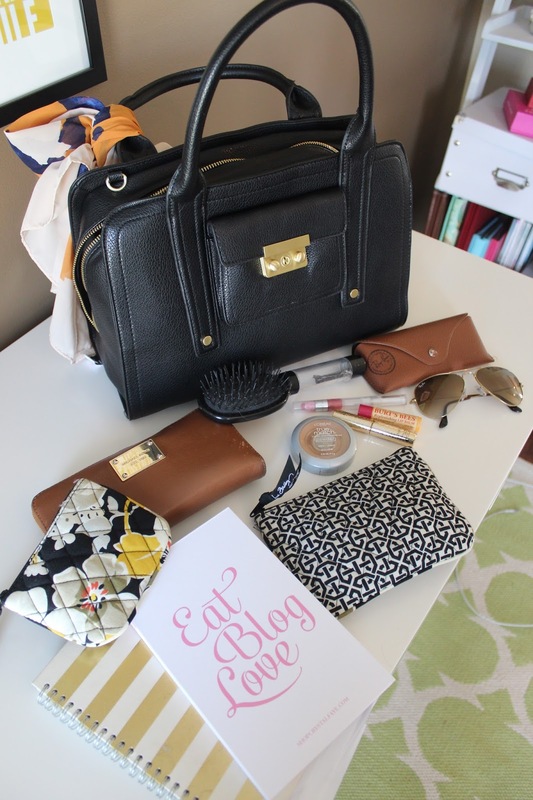 Besides, I'm nosey and love seeing what other girls carry in their bags! the bigger one has: L'oreal True Match powder (my favorite), a small tube of mascara (this one is Tarte), Burts Bees chapstick, and an Elf lip gloss. >If you're a blogger, you need this notepad. The pages are titled "Can't forget to blog about..." so that you never miss an idea. More on this tomorrow (see below!) but if you want 10% off any order right now, use the code: "KeepCalm"
>You're probably thinking-a shirt in your purse, is that necessary Katie? But it is (and not just because Ashley Greene has been wearing this shirt out and about, I kinda love her.) This isn't your regular t-shirt...it is the softest shirt you will ever wear and you can represent your home state at the same time! I call that a win. Get yourself one here. I like keeping it in my purse/in my car for those times I want to change into something casual or need something to wear to the gym (they also donate a portion of the profits to MS research!). **In regards to the "Eat Blog Love" notepad-hint hint there may be a giveaway for shop credit to Crystal Faye happening HERE tomorrow. Come back then. Happy Thursday! 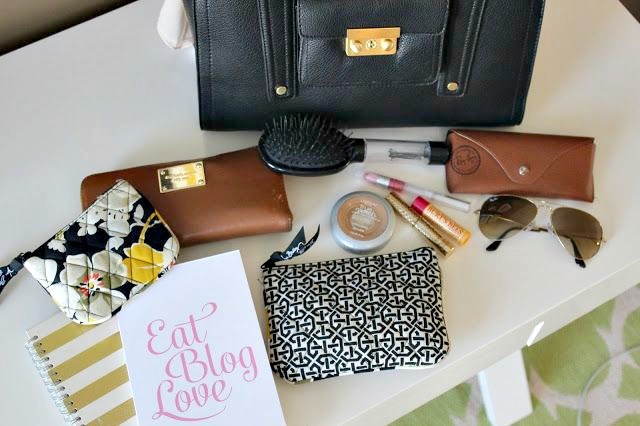 What do you keep inside your favorite bag? I can't believe you got so lucky with the bag! I actually have a "what's in my purse" post in my drafts that I was planning on publishing next week. I love everything you have in your purse - it's all perfect! I got the same bag and I am already obsessed with it!! I love that it is big but still holds it's shape so well!! LOVE! Man they don't have a NC shirt! :( I guess I could wear the 'my yall is authentic' ;) ha Love the notepad! I NEED that brush that holds bobby pins! I have never seen one like that!! I love that bag! Man I hope they still have one when I get to Target today! I've been eyeing those shirts too, so it's good to hear some feedback that they are as fab as I thought they would be. I'm constantly changing purses, so I'm like you and try to keep everything in smaller compartments and bags. It's so helpful! Plus I hate digging around in the bottom of my purse for something. Ok.. so I'm seeing SO MUCH about these bags. What am I missing? I bought the same bag (and I love it) and I ALMOST bought the same scarf to tie around the handles! It's just so cute! Love this! LOVE the bag!!!!!! I love the bag you got!! And how cute are those notebooks?! 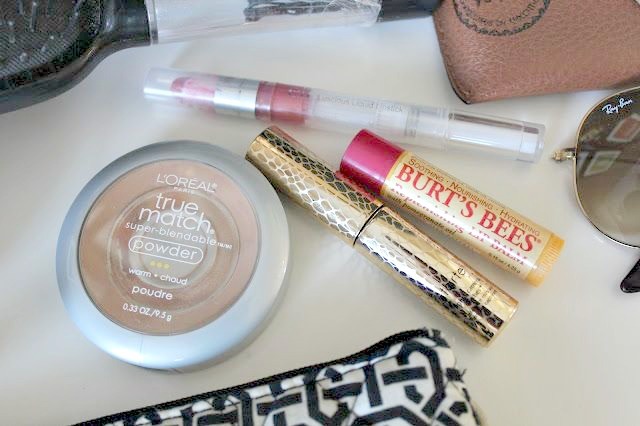 It's always so fun to see what's in other people's bags! You have such lovely things that you carry around with you! Love that bag! 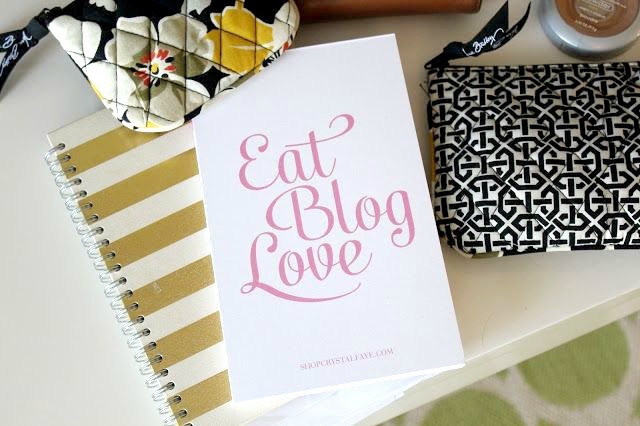 Curious about that eat blog love notebook too! how are the insides of your bag so cute?! i have like a tide stick, some squished orbitz gum and like 35 pink lip glosses! I clearly need to find prettier things to put in my box. Also, I think your bag and scar are the only PL items I like from the collection - too cute! I will definitely be buying the notepad ASAP! So adorable! The Phillip Lim bag is growing on me, especially with the scarf added to it. I am an avid eBay shopper and there are a ton of them listed already. I actually just bought my Prabal Gurung for Target Nolita heels and clutch a few weeks ago on eBay and wore them for the first time today. I got so many compliments on them. I may have to get this bag on eBay too! How cute is that bag!? and please tell me where you scored that brush! I have been carrying my bobby pins in an old altoid case... it's not really ideal! my sister calls my bag the mary poppins bag...you honestly never know what I am going to pull out lol. That bag is so cute! I totally paid no attention to the Philip Lim collection before it came out and saw it after it had sold out and was super sad I didn't scoop up one of those bags. They're so pretty!